Stanley Dobson, center, Cannon County Administrator of Elections, passed the Certification Exam for Administrators of Elections this week. 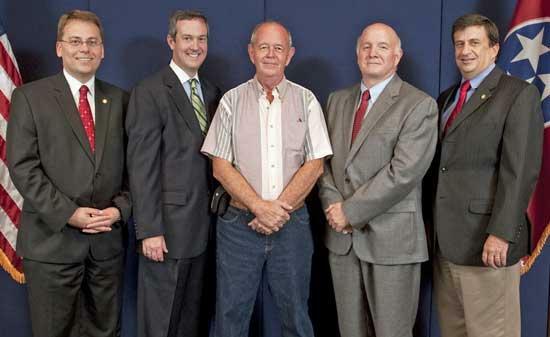 Tennessee Secretary of State Tre Hargett and State Coordinator of Elections Mark Goins have announced that Stanley Dobson, Cannon County Administrator of Elections, passed the Certification Exam for Administrators of Elections this week in Nashville. The exam is a rigorous one-day exam held at least once a year in Nashville. By passing the exam, participants demonstrate they have the level of knowledge and understanding required to be successful county administrators of elections in Tennessee.